This is the first and only sugar cookie recipe I’ve ever used. I found it a few years ago and have been in love with it ever since. The cookie is not super sweet, so the glaze is a very nice addition while not overpowering. I made these for tomorrow’s Yom Kippur break-the-fast. They look so cute and taste delicious. Makes about a gazillion five dozen. Combine powdered sugar, water, butter, corn syrup, and vanilla in a small bowl and mix until powdered sugar is moistened. I separate the dough into three separate pieces of plastic wrap before it goes in the fridge. The dough gets sticky and hard to work with if it’s out of the fridge for a long time. So this way, I only have a third of it to roll out at once, leaving the remainder keeping cool in the fridge. Cookie recipe from All Recipes. Glaze recipe is from who knows where–it was handwritten on a piece of scrap paper a few years ago and has the vanilla stains to show for it. They look so yummy. I may have to make them for my next birthday breakfast. Yum! I have never glazed sugar cookies before. I love the cookie cutter! These biscuits look so nicely done. Another idea is to put a dab of icing on the top of one biscuit and place a second biscuit slightly turned on the top, so that it makes a star. Which of your KA attachments do u use to mix the cookie dough? I’m really digging your Print Post gig. I’ll be using these recipes with my new Halloween cookie cutters! I don’t usually post on any commets or anthing, but I just had to say, I made these tonight and they are Fabulous! I love your site and your recipes. im making those tomorrow. i’ll post some pictures for ya…i got a silver kitchen aide for a wedding gift! Thanks for the easy printable link. It works great and I love it. Thanks so much. Hello~ I wanted to share with you that I baked these cookies tonight with the assistance of my daughters (soon to be 8 and 11 years old). The dough was really easy to work with after only chilling for an hour, girls had no patience. I used 2″ cutters in the shape of a number eight-for birthday recognition at school instead of the same old cupcakes. 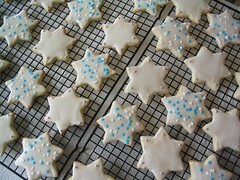 They held their shape nicely and lifted easy off cookies sheets. Glaze was okay, I added more vanilla and water. Had tons left over after glazing a gazillion, really 92 cookies. Oh yeah, They are DELICIOUS! This ones a keeper! Thank You! I made these today, without the aid of a beater of any assortment, and they’re still way easy to make. Way in love with this recipie, totally keeping it forever and ever, amen. My children and I just made these for Chanukah and they were divine. We used your favorite icing recipe (blue, of course) with blue and silver sparkles. The kids are still spinning around the house from all the sugar (and butter) but its all worth it. Thanks. can I us a gluten free flour base, and would the measurement be the same? The 5 cups of flour in the cookies. @Laura – Hi Laura, I have not used gluten free flour, so I unfortunately do not know if that will work.